Over the past five years, Savile Row institution Anderson & Sheppard has been quietly refining its casual offering into a considered selection of garments. 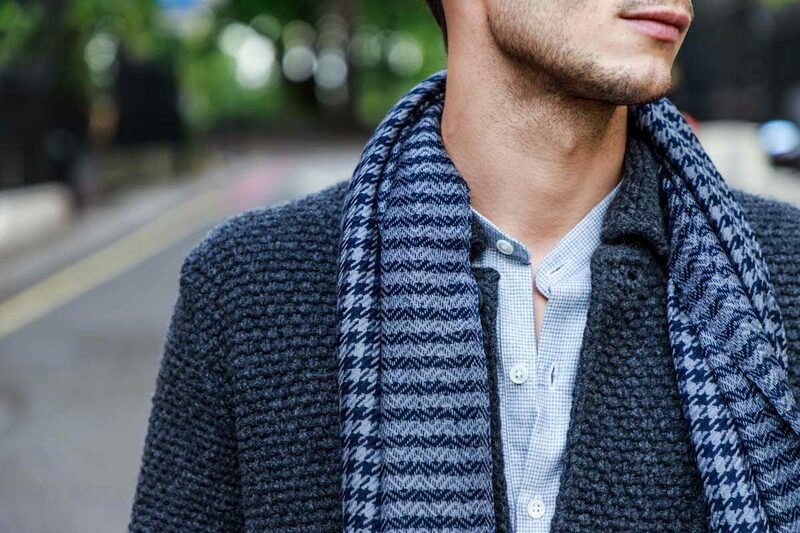 Anderson & Sheppard's casualwear offering is executed with the same flair as its tailoring. Photograph by James Munro. Growing a brand is hard to do. Do you simply offer more of what the brand is built on? Do you diversify the markets that you’re competing in? Or do you take things in a new direction and start anew? For Audie Charles and Anda Rowland of Anderson & Sheppard, a Savile Row institution for over 100 years, the answer was obvious. What they needed to do, they realised, was listen. They realised that the customers that they had been serving through their bespoke atelier were simply not being catered for anywhere in the market for large parts of their wardrobe. So in 2012 they opened Anderson & Sheppard’s haberdashery in London’s Clifford Street, to begin to put that right. Where the design process really sets itself apart is with its relationship with Anderson & Sheppard’s bespoke cutting room. “We don’t do the design in a traditional way,” says Rowland. “‘I went off to Bhutan and I saw this amazing… whatever, and was inspired’ – we don’t do that, because that’s not really how men shop. Guys coming here are not looking for that. 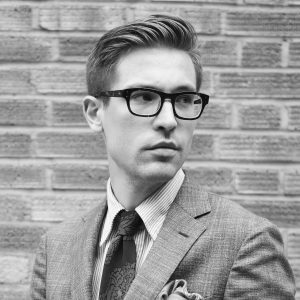 We do things that we think fit well into our customer’s lifestyle.” Every tailored garment begins life as a pattern cut by the bespoke cutting team, before being graded and then passed on to the specialist workshops, which has allowed Anderson & Sheppard to retain its unique shapes and silhouettes when moving to larger-scale production. It’s a process best exemplified by the brand’s relationship with someone who knew a thing or two about dialogue - the late, brilliant author A.A. Gill. One of Anderson & Sheppard’s most stalwart – and demanding – devotees, Gill was involved with “pretty much everything”, product-wise says Rowland. “That work jacket, we really went backwards and forwards with him on.” Charlies continues: “It was great, because he would wear things, like the travel jacket, for a week and then take it off and say, 'this works, that doesn’t work, this pocket is too high' and so on. So it was great to have someone bash it around.” Gill had a unique ability to rethink or re-contextualise the pieces they created, says Charles, recalling a particularly memorable deployment of the linen pyjamas. “Adrian took them to Rome and wore them in Rome for a weekend with a T-shirt with the pyjama top open when it was boiling hot. Everyone kept saying, ‘Oh that’s a great jacket, where did you get it?’ He just came to things from a different angle. Sometimes you would agree with him, and sometimes he was just difficult for the sake of being difficult. But he was such an original mind, and brave about how he put things together or what he could do with things.” Several more pieces inspired by his ideas are in development, though Rowland says they’re not ready to talk about them just yet. 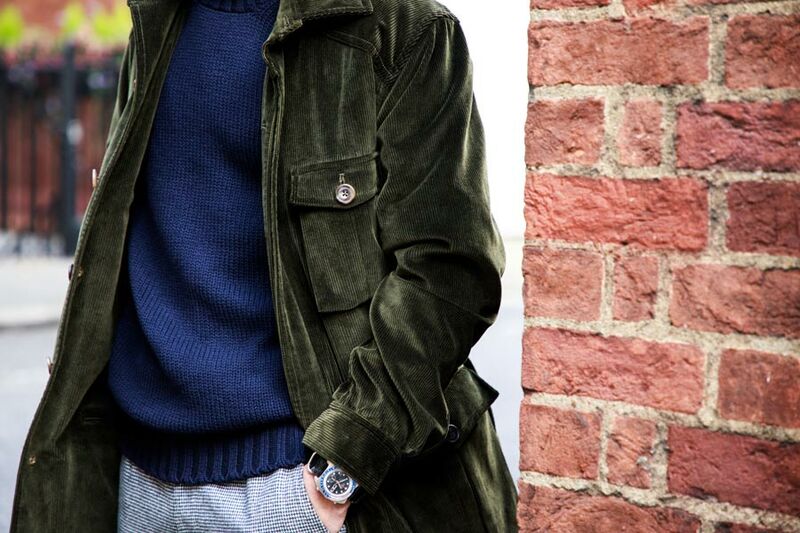 Anderson & Sheppard's travel jacket is rendered in corduroy for autumn/winter. Photograph by James Munro.